While we always thought that baldness was something that occurred only in men and we women need not worry about it, of late, there have been too many instances of females with thinning hair and traces of bald patches. It all starts with incessant hair fall and stunted hair growth and leads to thinning hair. However, if you are suffering from hair loss, there is no reason to worry, since there are ways in which it can be treated. Also, by worrying, you are only increasing your stress levels and giving your body more reason to shed hair. In order to treat any problem, it is necessary to know the underlying cause of the problem. So lets see what are the causes and treatments for hair loss in women. It can be in your genes to get female pattern baldness that can be leading to excessive hair loss. While this is not reversible, you can go in for a minoxidil (Rogaine) treatment to control hair fall and promoting hair regrowth. If you are not getting a wholesome and balanced meal, rich in proteins, vitamins, minerals and carbs, it could also lead to hair loss. If your protein intake is low, the body will cut the protein supply to your hair and stop its growth. Consume a balanced diet, especially one rich in proteins. Physical stress such as an accident or a surgery can break the hair growth cycle of growth-rest-shedding. It pushes the hair to go to the shedding phase. As a result, a lot of hair is lost and does not grow back for a while. However, it goes back to normal once the body recovers from the physical stress. Anxiety and mental stress can also cause hair loss, by causing imbalance in the body. Practice meditation and deep breathing to overcome stress and alleviate hair loss. Pregnancy causes a swing in hormones that regulate the hair growth cycle and also causes physical and emotional stress. All this put together can cause excessive hair loss. However, a couple of months after your baby is delivered, the hair growth pattern falls back to normal. One in ten menstruating women suffer from anemia. The iron deficiency which is the root cause of anemia can be fixed by taking iron supplements, thereby also controlling hair loss that is caused by it. PCOS or polycystic ovary syndrome where the female body produces excessive androgens can also cause hair thinning among other symptoms like facial hair growth and changes in menstrual periods. 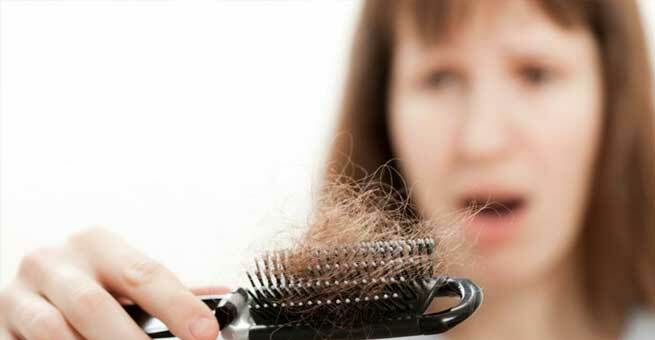 The way to overcome hair loss caused this way is to treat PCOS and reverse the hormonal changes. If you are going off birth control pills then the androgen level increase will activate the androgen receptors in the hair follicles. This will shrink the follicles and cause hair loss. The way to treat this is to address the hormonal imbalance. This is one cause for which you yourself are to blame. Excessive use of chemicals or heat on the hair causes the hair shaft to lose protein, become weak and leads to hair fall. Refrain from styling your hair too much. Also, take good care of your hair with protein masks and conditioners in order to strengthen it.